EUR/CHF made another attempt at 1.61 before falling and triggering our long orders at 1.6050. It looks like the play today is risk aversion as equities and carry trades around the world sell off, and hit our long EUR/CHF position. The pair his a low just under 1.6020, but with it’s current bounce back after the positive ISM data, I have decided to close the position as I feel risk aversion will play out for the rest of the day and probably throughout the rest of the week. Close position at market (1.6045). Good morning! 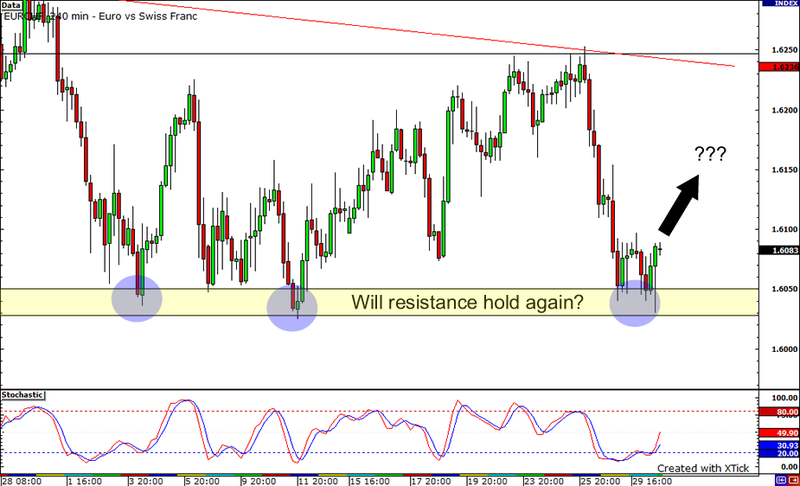 There’s a nice technical setup once again in the EUR/CHF market as the pair tests and consolidates around 1.6050. On the chart, we can see the pair consolidating for the past few trading sessions as it ranges in between 1.6050 to 1.6100. Stochastics are starting to coming out of oversold territory indicating that support will hold and that buyers may this one out. With sentiment in the markets that the ECB will raise rates I am long biased on this pair.